Electric toothbrush deals is almost a redundant phrase, because there are two important things to remember about electric toothbrushes and the first one is this: only a complete dunderhead would pay full price for one, as they are very frequently offered at reduced prices. It's also a fact that electric toothbrushes, used correctly, are far, far better than manual brushes, and worth it if you value healthy teeth and gums. After Black Friday and Cyber Monday, there are really good Christmas deals to be had on electric toothbrushes. In fact, there's deals to be had all year around. Oral-B Genius 9000 | From £90| Was up to £300 | Save up to £210! 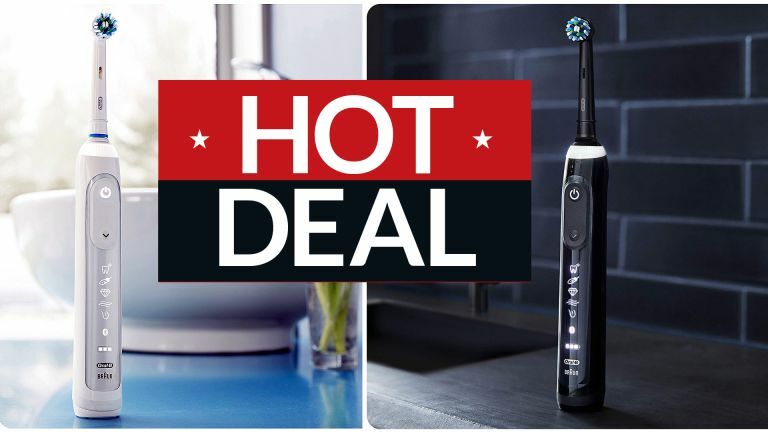 Although electric toothbrush deals come thick and fast at this time of the year (and at every other time of the year), it's hard to imagine any other deal topping this one. The Genius 9000 offers six cleaning modes ('including Whitening, Sensitive and Gum Care'! ), comes with four brush heads (about a year's worth) and offers sensational cleaning. The 'smart' functionality – an app that uses your phone's camera to monitor your brushing – is a great idea in principle but a bit crap in reality. However, even if you ignore that element entirely, getting a brush this good for £200+ off (realistically, more like £100 as nobody in their right mind would ever pay that RRP) is a great deal. Well, this is currently T3's top-ranking electric toothbrush, and praise comes no higher than that, short of a visit from the Nobel Prize committee. This uses Philips' legendary sonic waves to gently vibrate your teeth to zingy cleanliness and your gums to rosy pink health. Philips promises, 'whiter teeth in just 1 week vs a manual toothbrush', which is a fair boast. With 3 cleaning modes and 3 intensity settings (plus a pressure sensor to prevent you brushing/pressing too hard) the ProtectiveClean 6100 is versatile but not overly complicated. You also get a travel case and 'bonus brush head', making a grand total of 2. This trumps the Philips by having 3 brush heads, and uses Oral-B's time-honoured rotary brush motion to scoop away plaque and bits of spinach. We prefer Philips' sonic attack, which feels a bit like a small swarm of friendly bees cleaning your mouth but nonetheless, this is another excellent brush, with a huge discount on its RRP. Several Smart 6 variants and bundles are available in this sale – we favour the one with a screen showing a countdown timer and a face, which begins to smile and wink at you if you brush for long enough. That's great encouragement. The electric toothbrush market is dominated by Oral B, with its rotary action brushes, and Philips with its Sonicare brushes, which use the power of vibration to dislodge debris and buff teeth and gums to a fine sheen. They are both equally effective in our experience; it boils down to which you prefer. In our experience, Philips brushes tend to have slightly better battery life, and to be easier to keep clean, but those are pretty marginal gains. Some of the more premium brushes you can buy from both brands now include Bluetooth connectivity and accompanying Android and iOS apps. Some – The Oral B Genius 9000 and Philips DiamondCare Smart for instance – even 'watch' you while you're brushing, to let you know that you've missed bits. In our view, this technology is not yet fit for purpose, but don't let that put you off: the brushes with the 'smart' tech in are otherwise superb. One other thing to consider then buying a brush is how many replacement heads it comes with. The brush parts of the devices tend to wear out every 2-3 months and cost £2-£3 each to replace, so the more the merrier. The current most recent flagship brushes are Philips Sonicare 6100 and 5100 ranges and, for Oral B, the Genius 9000 and 8000. However, older models are still available and all but identical in terms of brushing power. Often, this will be where the real bargains are to be found, come Black Friday.